Great for websites, emails, and using as personal clip art! Your awesome pucture right there on the card! What better way to personalize your computer with your caricature! Change your caricature whenever the mood strike! It's fun! Whether you want a gift that will thrill or you simply want to see how you'd look at a caricature, Dimple Art has you covered! Our skilled artist are famous for creating stunning caricatures -- and you'll find the caricature is just like you want it or we'll keep drawing until you're thrilled! 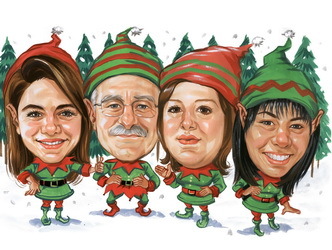 Caricatures are a unique and fun way to give theperfect gift that says you really cherish your friends and family. But be prepared! Those that receive Dimple Art Caricatures are often so excited they might jump for joy, smile from ear to ear, and even hug you until it hurts! It's powerful stuff! And what about you? Why not grab a personal caricature for yourself? They're inexpensive, and you'll see exactly how you look in the eyes of others. We hope to makeit clear for you in just a moment who will come through for you and help you to get the perfect caricature. First, if you have a moment it's very important that you read some testimonials from actual customers. Please click here to read them now. Now that you've seen our testimonials and know what we can do for you, let me tell you what you get when you order the caricature from us. All you need to do is send us a photo, or photos, of yourself or loved one, and tell us how you want it customized. 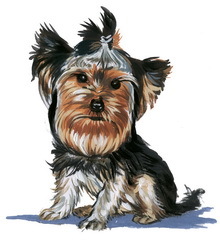 We'll create a caricature -- a picture of beauty -- that you, your family, and your friends will cherish forever. Then, we will upload your funny caricature to " Member's Area ". What is the member's area? The Member's Area is the special zone that only customers of Dimple Art can get into. Once you purchase your caricature from Dimple Art, you will be asked to create a username and password. This combination will be used to login to your member's area. What do I get in member's area? 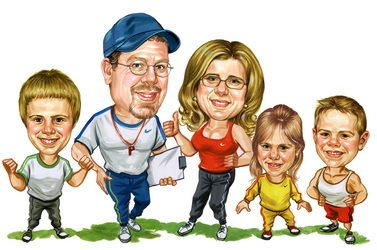 ..and professional custom designed caricatures that your friends will envy! 1) Digital Caricature Starring YOU!! 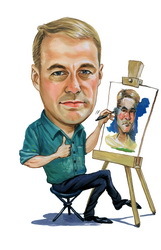 This is your actual personalized caricature that you will be able to download from your member's area. Once you've purchased your caricature, you can keep re-using it for various clip-art purposes infinitely. Caricatures add life to name cards, labels, stationary, websites, and even business presentations! It's not just an ordinary drawing to decorate your wall. Please note that the digital caricature is in simple JPG format at 300 DPI. So, you can easily print your caricature by normal color printer. 2) Be A Star With Custom Shirts And Merchandise over 40 products ! Put your new caricature on frames, posters, mugs, T-shirts, sweatshirts, etc. to become an instant celebrity. Each item is custom designed and delivered right to your door. 4) Your Face on Hundreds of Bodies! Buy one caricature; get a hundred when you used DimpleArt Software (available for download FREE). With one caricature face, you can create hundreds of variations by changing the body pose and theme. Plus, after you finish creating, you can save and send it as an e-card to your friends without using a browser!! Just fill in the email, write your message, and send. It's that easy! 5) Your Face On Your Desktop! Are you bored with your desktop wallpaper? 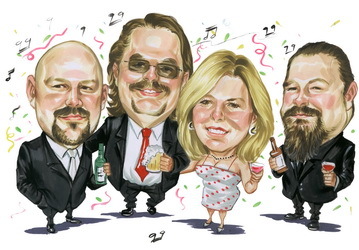 Spice it up with a custom caricature of you! Nothing states individuality and brings happiness like unique caricature desktop wallpaper. We will create the image that is automatically optimized to fit your desktop perfectly. Plus, Quality of service is GUARANTEED! If for any reason you are not satisfied, we will re-draw your caricature until you are satisfied, or simply refund the full purchase price, NO QUESTIONS ASKED. This is a Dimple Art exclusive, so don't settle for imitators! NO exaggeration, a little exaggeration, and over exaggeration. You can pick the level that works best for you. We are committed to our customers. We don't let a single customer go away unsatisfied. We want our customers to come back again and again because of our quality services. Our prices are VERY AFFORDABLE! Those artists sitting in the mall or at parks drawing caricatures usually ask a hefty price for these fun pictures. But why pay more when we offer better quality and LOW, LOW PRICES? Plus, you won't find one of those mall artists offering a MONEY BACK GUARANTEE! Think you have to break the bank for an artist to sit down and draw a custom caricature for you? In fact, prices start at only $42.99 and you're guaranteed to be thrilled with your purchase! For the best caricatures you'll find anywhere, and a total customer commitment, you've come to the right place! By clicking the button above you'll be asked to upload a photo (or photos) and fill out a brief form so we know exactly what you want. We will also set you up a "Member's Area" so you can view your caricature when it's done. And don't worry ... your information is safe with us. We don't sell, rent, or trade any information you share with us.